Are you looking where to buy recycled glass countertops in Maryland, Northern Virginia, Baltimore, Annapolis, Alexandria, Fairfax or the surrounding areas? We are dedicated to helping the environment by providing options for countertops made from recycled glass that are not only eco-friendly but stylish as well. Keep reading to learn the benefits of recycled glass countertops, like Icestone and why they just might be the perfect counters for your kitchen or bathroom. If you’d like to talk to a sales representative about picking the perfect countertop for your home, give us a call at 410-712-0601. Would you rather get started right away? Click here to fill out our online request form. What Are Recycled Glass Countertops? Countertops made from recycled glass are a type of eco-friendly countertop that is made from a glass left over from sources like curbside recycled glass, demolished buildings, and the like. The glass is mixed with a concrete binder and has color added to make a surface material that can be put into place as a part of larger kitchen design. The materials used to make recycled glass countertops are non-toxic and environmentally sound, making them perfectly safe for many homes. Why Choose Recycled Glass Countertops? Beyond being a green, sustainable solution to kitchen remodeling, there are a number of reasons recycled glass countertops are chosen by homeowners looking to give their kitchen or bathroom counters a new look. Easy, Everyday Maintenance – Don’t stress out about cleaning your counters again. Among the many pros of recycled glass countertops, one of the primary benefits is that they’re super low maintenance. Some materials have specific cleaning instructions that need to be followed, but making your recycled glass counters look as good as new is often as simple as using soap and water to wipe them down. Long-Lasting & Cost Effective – If you’re worried about getting your money’s worth, it helps to know that recycled glass can last for decades, meaning that you will likely never have to fully replace your countertops. Eye-Catching Looks – If you want eye-catching counters, there aren’t many materials that immediately stand out the way recycled glass kitchen countertops can.. Whether it’s the striking colors or the way the light hits them, recycled glass countertops have a way of grabbing a person’s attention in a way that no other material quite can. Non-Absorbing Material – With many bathrooms and kitchen countertop materials, you have to be careful of the water that splashes from your sink or sits on the bottom of your glasses, because that water can be absorbed and leave stains. However, with recycled glass countertops, this is not an issue. Your glass counters will not absorb any water left behind. You can simply wipe it up and not have to worry about unsightly, permanent staining. Be Careful of Cut Marks – When you are cutting food on your glass counters, be sure to use a wooden cutting board so that you don’t leave any scratches. Cut marks in glass can be especially difficult, if not impossible, to get rid of. Periodic Sealing Needed – Your counters will need periodic sealing to ensure the surface is protected throughout its lifetime. It’s an added aspect of maintenance that not many people think about, but one that needs to be taken into consideration before committing to recycled glass as a countertop material. The Cost of Recycled Glass Countertops? Recycled glass countertops are becoming the leading choice for homeowners looking to make cost-effective and environmentally responsible upgrades to their kitchen. Take Advantage of Sales – We are constantly coming across great deals on discontinued, or overstocked recycled glass slabs and love to pass these deals on to our customers. Contact us today to find out if we have any great deals available for you. Be Flexible When It Comes to Features – Certain features, like custom edging details, can drive up the costs of your countertops. Being flexible when it comes to features allows you to pay more for what you really need, and save on what you don’t. 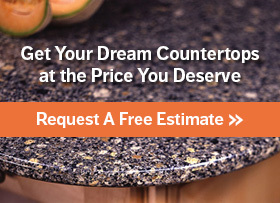 Buy Direct from the Specialists – A countertop installation company that focuses only on countertops will typically be able to get you a better price than a full-kitchen remodeling company. Shop around, compare quotes, and work with countertop specialists that not only give you the best price but also provide the best service now and in the future. How does the price per square foot of recycled glass compare to granite, quartz, and other high-end materials? Expect to pay between $60 & $120 per square foot for your recycled glass countertops, which is more affordable than medium quality granite. At Express Countertops, we carry Icestone and Cosentino as well as other brand name manufacturers, so you can be sure you’ll be getting quality materials along with expert contractors who will have your new fixtures in place before you know it! Contact Express for 7-Day Installation – Guaranteed! Call us today at 410-712-0601 or click here to reach us online and get in touch with us and let us know just what we can do for you! Interested in installing recycled glass countertops in your home? Call us today at 888-675-9513 or click here to reach us online to let us know just what we can do for you! At Express Countertops, we provide expert service when it comes to recycled glass countertops so you can get exactly what you want in order to perfect your kitchen. If you want to know how much your new recycled glass countertops will cost, or you have any additional questions, get in touch with us today and we’ll be happy to help you!